Who says you can't have it all? This stunning 3,600 square foot Craftsman styled home provides the perfect retreat for those seeking beauty, luxury, relaxation and fun in a beautiful mountain setting. The impressive great room is as beautiful as it is functional. The stacked rock wood burning fireplace ensures warmth on chilly evenings and the spacious screened-in veranda offers a quiet place to enjoy fresh mountain air overlooking the private backyard lake. Luxurious seating and dining furniture in this area make it a favorite spot for all. 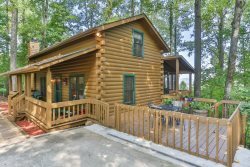 Woodring Branch which is only 6 miles from this home, has a boat ramp, picnic areas and camp sites. The beautiful and well equipped kitchen boasts stainless steel appliances, a Keurig Coffee Maker and every thing you could possibly need to whip up some fabulous meals right at your fingertips. This home has two King Masters, one on the main level and one on the terrace level to provide the ultimate in privacy. There is also another fully equipped kitchen on the terrace level to compliment the desire for privacy. Both King bedrooms have been designed for comfort and luxury offering only the finest in bedding and accessories. The terrace level living area sports a pool table and a 60" HD Flat Screen TV to enhance your mountain vacation experience. The terrace level patio is host to a luxury hot tub where star gazing is everyone’s favorite. Why are the stars in North Georgia so much brighter???? After a great meal, a competitive game of pool and perhaps one of the best nights sleep you've ever had, wake up to a delicious cup of coffee and walk down to the lake and relax a while on the covered pavilion or jump in the 4 person paddle boat for a little morning exercise and exploring. Don’t forget your fishing poles, this little gem of a lake is stocked every year. Lakeside Majesty is one of those places you will be glad you found and look forward to coming back to time and time again! So pack the bags, don’t forget the family pet and head on up to a vacation destination you will never forget! In addition we provide a complimentary start-up supplies of: Toilet Tissue (2 rolls per bathroom), 1- roll paper towels, 4- kitchen garbage bags, 1- hand soap for each bath and kitchen, dishwasher detergent, dish washing liquid and laundry detergent for at least 2 loads. This is my second time and have convinced my family to spend Christmas and or Thanksgiving in the Mountains. Also considering celebrating my birthday there as well in May. All around beautiful inside and out. If it's cold and rainy there so many indoor activities. If it's nice theres the lake boat etc. Like I said inside and out. Everything was great. So beautiful! This house was like woodsy modern in style and so beautiful! Craftsmanship was amazing! Great job builder! The drive was long from Mississippi, but when we finally arrived...the inside of the house looked exactly as the pictures...The beds were so comfortable, the kitchen had everything we needed...the screened in porch was a bonus and we fell in love with the lake and fished daily.... We did catch one good sized brim but nothing else..we did see catfish in the lake as long as an arm...just wasn't interested in our bait..lol...So peaceful..the boys loved the terrace level and we just had great , quiet family time...we will definitely be back! We really enjoyed this stay. We've stayed at cabins before but never one this nicely furnished and so well thought out. I posted pictures on social media and instantly received several messages asking where was the place and how could they book. Beautiful place, wonderful experience. As we left we were trying to think about when we'd visit again. The property and service was amazing we will be back. Beautiful! House had everything and more! We just enjoyed the peace and quiet of the area. Everything was perfect. The cabin was beautiful, great location, dogs loved the lake, electricity at the dock was a big surprise. Loved it! This property was beautiful! The linens and towels were like those at a fine hotel. The kitchen had everything we needed...we cooked most of our meals in. We enjoyed the small lake and used the paddle boat several times, we even made s'mores one night at the fire pit. We also appreciated being able to bring the dogs. Thanks for furnishing beds and food dishes! I cannot begin to express the wonderful stay at Lakeside Majesty. From the moment we got up the hill and saw it peeking through the trees I knew it was going to be a wonderful experience and views. My children and I jumped like kids when we opened the doors (Got it on video haha) mouth wide open, jaws dropped, heart racing and so ready to begin our vacation in our second home now away from home. Beautifully decorated and modern, but yet cozy with the feel of an old world charm. Loved the trails, The trees, the Lake, It was cold during our stay, but we managed to look around the property and take in every square inch so we would not forget. Took many images and I am still in awe of it all. I can talk about this place forever and ever. It is definitely a beautiful place. I am in love with the mountains of Georgia and the smooth experience and professionalism of everyone at Mountain oasis that made this Birthday vacation. As always, our visit to Lakeside Majesty was awesome. It is our favorite place to unwind. I appreciate that it is always immaculately clean. Hi, our stay at Lakeside Majestic was wonderful, beautiful home well appointed and maintained. The folks at Mountain Oasis were great and very helpful.